In fifth pAsuram, parAnkuSa nAyaki says “There is no use of my knowledge which is not desired by my greatly beloved SrI rAma, the son of dhaSaratha”. Subsequently, parAnkuSa nAyaki says “What is the use of my knowledge when it is not desired by chakravarthi thirumagan (the son of emperor dhaSaratha) SrI rAma, who killed rAvaNa et al who committed needless offenses towards sIthA, the divine daughter of king janaka”. kuRaivilam – we have no use. SrI rAma burnt down the unjust tumultuous rAvana’s wealthy city for the sake of sIthAp pirAtti who is complete with the attractive tender sprout like complexion, who remained alone in a confined manner, was famous [for her mercy to being imprisoned to protect others] and who has a sweet voice like that of a parrot. Such emperumAn, after ascending the throne in ayOdhyA, who was wearing the crown which is given best fragrance by the well blossomed thuLasi garland on it which is having honey, mercifully lived manifesting his cool mercy in the earth which is surrounded by ocean. We have no use of our knowledge which is not liked by such emperumAn. thaLir niRaththAl kuRaivillA – As said in SrI rAmAyaNam sundhara kANdam 15.28 “kurvanthIm prabhayAdhEvIm sarvAvithimirAdhiSa:” (One who drives away the darkness in all directions by her bodily radiance) – due to not bathing for ten months of separation from SrI rAma, the radiance in her body got reduced, still was enough to drive away the darkness of all ten directions; raghuvamsam 10.2 “SOkathamOpaham” (radiance which drives darkness away). thanich chiRaiyil – Her constrained stay amidst the rAkshasis (demoniac women) is like the separation of sun and his rays. viLappuRRa – As said in SrI rAmAyaNam sundhara kANdam 15.23 “kruSAmanaSanEnacha” (she was with tearful eyes, in a pitiable state, due to not having food), as explained by hanumAn to SrI rAma “she was not caring for herself”; another explanation – she remained famous in the world for having imprisoned herself in rAvaNa’s city by taking up the shackles on her own without caring for herself, to remove the shackles from the legs of dhEva sthrIs (celestial damsels). kiLi mozhiyAL kAraNamA – Reminded by her words through hanumAn’s words, SrI rama said in sundhara kANdam 64.15 “madhurA madhurA lAbhA” (the sweet person, with sweet words); for the sake of the one who has such sweet voice. 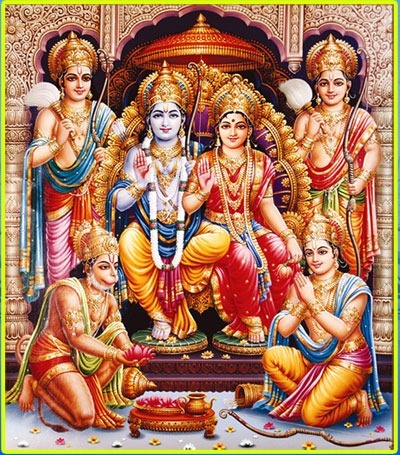 kiLar arakkan – His anger is so tumultuous that he cannot bear the togetherness of the mother and father [emperumAn and pirAtti, are the real divine parents for every living entity]; as said in SrI rAmAyaNam ayOdhyA kANdam 1.7 “udhIrNasya rAvaNasya” (well nourished rAvaNa). nagar eriththa – Destroying the residence of rAvaNa and flattening the city [so that one can easily cross from one end to another without any hurdle]. Burning down rAvaNa’s well groomed city. kaLi malar … – kaLi – honey. One who is having divine crown which has the fragrance of thirruththuzhAy (thuLasi) garland with flowers having honey. When he descends like a mortal being, his divine servitors would also appear as part of his entourage; thus, even if he is decorated with kalambagam (collection of flowers), they (AzhwArs, emperumAn‘s devotees) will praise him as being decorated with thiruththuzhAy only; [giving a worldly example for this] even when pANdiya and other (chEra, chOLa) kings are decorated with karumugai flower, the poets will praise them with their appropriate [favourite] flowers such as vEmbu etc only. kadal gyAlaththu aLi mikkAn – Having cool mercy in this samsAram itself. Looking at the sufferings of the samsAris (worldly people), his divine heart became fixated here; he then had to be sent off to paramapdham by separating pirAtti from him [sIthAp pirAtti first ascended to paramapadham], separating iLaiya perumAL from him [lakshmaNa also ascended to paramapadham citing the violation SrI rAma’s order as a reason] and by informing “the purpose of your avathAram (incarnation) is complete; you have to ascend to paramapadham now”. kavarAdha … – There is no use of my knowledge which is not liked by such emperumAn. What is the use of this knowledge which is similar to the vanvAsa gyAnam [knowledge/thoughts of sIthAp pirAtti, where she desired to stay under the guidance of rishis (sages) in their hermitage, during her pregnancy], which led to her second separation from SrI rAma? Such knowledge only leads to separation [from him]. This entry was posted in thiruvAimozhi, thiruvAimozhi 4th centum on March 31, 2017 by Sarathy Thothathri.